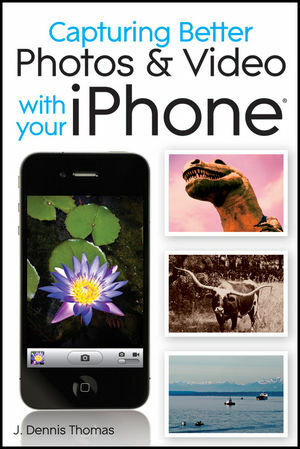 Offers unique advice for taking great photos and videos with your iPod or iPhone! Packed with unique advice, tips, and tricks, this one-of-a-kind, full-color reference presents step-by-step guidance for taking the best possible quality photos and videos using your iPod or iPhone. Top This unique book walks you through everything from composing a picture, making minor edits, and posting content to using apps to create more dynamic images. You’ll quickly put to use this up-to-date coverage of executing both common and uncommon photo and video tasks on your mobile device. Full color throughout, Capturing Better Photos and Video with Your iPod or iPhone gets you well on your way to making the most of your mobile device’s photo and video capabilities. J. Dennis Thomas is a freelance photographer and author based out of Austin, Texas. He has more than 25 years of experience behind the lens. He has been using the iPhone camera since Apple first made it available. His photography has been published in many regional and national publications including Rolling Stone, SPIN, Country Weekly, and SXSWorld magazines. Chapter I - Get to Know your iPhone. Capturing Better Photos & Video with your iPhone. Chapter 2 - See Like a Photographer. Chapter 3 - Understand the Impact of Light. Chapter 4 - Love the Apps. Keep It Sure and Steady. Chapter 5 - Create iPhone Video. ClassicTOY - Plastic Toy Camera. Simulating Shallow Depth of Field. Chapter 6 - Edit with Photoshop Elements 9. Chapter 7 - Edit with iPhoto. Download your Photos and Videos. Chapter 8 - Share Your iPhone Photos and Videos. Upload Photos and Video to Facebook. Send Photos and Video to Flickr.